Who is the MVP of the Marketing Bowl: Social Media or Super Bowl Ads? If you read this blog, you likely already care less about the Saints versus the Colts than you do about Super Bowl ads versus Social Media marketing. After all, the real money isn't earned from the battle on the field but in the battle that occurs during timeouts: Each player on last year's winning team earned a bonus of $83,000 while NBC earned around $213 million in ad revenue for the telecast. A shift is occurring in the relative importance to marketers of Social Media and Super Bowl advertising. Of course, the 2010 Super Bowl isn't the first we've seen of the marriage of Social Media and Super Bowl ads. Last year, Doritos struck gold with a UGC (User-Generated Content) ad produced by two unemployed brothers, and the brand is back this year with more UGC ads competing for even greater prize money. But this year, there's a difference: The first evidence that the world has changed between Super Bowl XLIII and XLIV came from Pepsi's news it would not advertise during the big game; instead the brand is opting to invest its marketing budget in a Social Media marketing program called Pepsi Refresh. Many of us in the Social Media business were a bit shocked by this, not because Pepsi saw the importance of Social Media marketing but because they saw it as an alternative rather than an adjunct to their Super Bowl ad campaign. As I said to 1to1 Media at the time, "There was a part of me that was a little surprised that (Pepsi) didn't think about layering a social media program on top of a Super Bowl ad." While Pepsi is to be commended for using the "Social Media vs. Super Bowl ads" hype for terrific PR advantage, the fact is that advertising and Social Media go together like brats and beer. Advertising is great at raising awareness to a mass audience, while Social Media marketing is perfect for building deeper relationships and influence. The two are mutually beneficial, not mutually exclusive. This paired benefit is not lost on other brands; in fact,the first sentence of the New York Times article says it all, "Coca-Cola is telling Pepsi-Cola that when it comes to Super Bowl advertising, you can walk and chew gum at the same time." Coke is one brand that will use its Super Bowl ad to promote its Facebook program, http://facebook.com/livepositively, where consumers can send virtual goods and earn Coca-Cola donations to the Boys and Girls Clubs of America. Audi is another Super Bowl advertiser that is using their valuable ad time to drive consumers into a Social Media venue; their "Green Police" ads direct consumers to the Audi YouTube channel where the humorous ads can be viewed, rated, and shared. On Twitter,Unilever will be engaging people who tweet about their Dove Men+Care ads in real-time during the game and E*Trade will be directing viewers to BabyMail, a site to send e-mail messages using voices that simulate baby talk. And this is where the interesting shift in the recognition of Social Media marketing is evident: Last year, brands used Social Media marketing mostly to develop content for and promote their Super Bowl ads, but this year Super Bowl ads are being dedicated to the support of larger Social Media marketing strategies. The servant has become the master. The reason for this shift is obvious: Consumer habits are changing. Back in 2007, Forrester's North American Social Technographics Online Survey found that only 25% were Joiners--people who maintained a profile on social networking sites. In 2009, that figure had risen to 59%. The shift in consumer media consumptions is continuing, and this year's Super Bowl will not be the end of the evolution of marketers' budgets and strategies toward Social Computing. This blog post was cross posted with the Forrester Blog for Interactive Marketers. There is a lot of buzz about Social Media ROI, and since the topic is complex, there will continue to be buzz about it for years to come. Brands want to know that Social Media works, what works, and how to invest their money. Much of the results generated by Social Media can be measured quantitatively and qualitatively: transactions, decreased customer service costs, increased awareness, improved sentiment, etc. But some of the advantages from Social Media cannot be measured, because much like investments in insurance and tires, the benefits come from risk avoidance. Let me ask you a personal question: In 2009, what was the ROI of your investment in life insurance? The vast majority of you paid your premiums and filed no claims (or you wouldn’t be reading this). You received a negative ROI, so clearly that means you’re suspending your life insurance in 2010, correct? Perhaps you might argue that the benefit received from your payment of insurance premiums can only be measured over the long term, and you’d be right—to a point. Even over the long term, most of us will still experience a negative ROI from our insurance investment. This is because insurance companies need to generate a surplus from many people to cover the cataclysmic costs of the unfortunate few. Some of us will pay life insurance premiums for 70 years, while others will meet our demise after paying a single premium. So, if a rational person knows with great confidence that his or her likely lifetime insurance ROI is negative, should they cancel their life policies immediately? The answer is still no, because one of the benefits we receive from insurance—in fact, the most significant benefit—isn’t financial but emotional. We pay for insurance because it gives us peace of mind that our families are protected in the unlikely event tragedy strikes. Social Media is like corporate reputation insurance. You pay premiums in the form of building relationships, listening, responding, creating widgets, and building communities. And because you’ve done so, you’ve earned protection that can help should a PR disaster strike—you have an existing group of people who have affinity for your brand and an existing channel in which to reach them. Speaking of disasters, what is the value of avoiding disasters that you can’t know would otherwise occur? Take the tires on your car. How many miles do you have on them? You could ride on them another six months, saving you cash. Alternatively, you could replace them now, but where’s the ROI of that? Buying tires now versus later is always a negative ROI because you lose the time value of money, and the benefit of the new tires is completely unquantifiable. If you replace the tires, you cannot know if they would have been fine for six months (no cost), or if you would’ve walked out of work to find a flat tire (low cost), or if you might’ve had a high-speed blowout (high cost). If you change your Social Media tires, how can you know and quantify the costs you’ve saved by preventing problems you don’t have to face? I recently had a problem with an air carrier and tweeted as much. I received a rapid response, was satisfied with the response, and tweeted my satisfaction. This company was minding its Social Media tires and because of that, they cannot know the positive ROI they generated by avoiding the negative ROI of a Social Media flat tire. What possible outcomes might they have faced had they failed to listen and act? Maybe I would not have tweeted again. Or maybe I would’ve created a video a la United Breaks Guitars and sparked 7.4 million negative impressions. A news organization actually contacted me about the incident, and I declined to share my story because the company met my expectations; it’s likely the company’s quick Social Media response helped them to evade a negative online article that would’ve been seen by tens of thousands and lived for years in Google’s database. What is the ROI of the road not taken? What disasters might your organization’s Social Media programs avoid? How do you calculate the cost of incidents you don’t experience and cannot imagine? I’m not suggesting much of Social Media ROI is not calculable, just that all of it isn’t. If you don’t approach Social Media with an eye toward the risks managed and avoided, then you really aren’t considering all the benefits Social Media ROI delivers. Of course, while the ROI may not be fully and completely calculable, it can be fully estimated. Forrester has an approach known as Total Economic Impact, which incorporates costs, benefits, risks, likelihoods, and future opportunities into the evaluation. Watch for Forrester reports that use the TEI model to better define Social ROI in the future; in fact, I had the privilege of reviewing an upcoming report that explores TEI for B2B Social Media ROI from Laura Ramos today. If marketers demand hard and demonstrable ROI from all of their Social Media efforts, then they will fail to invest properly and wisely. This same attitude might also cause them to stop paying insurance premiums or ride on bald tires, but I’m not expecting those are trends we’ll see in 2010. This blog post was cross-posted with the Forrester blog for Interactive Marketing Professionals. Twitter was the story of 2009, growing from less than 5 million monthly users to almost 30 million in the course of six months. People joined, brands rushed in, and words like “Tweet” entered our common vocabulary. It was a heady year for Twitter, but has it had its day in the sun? What do the headlines mean? First of all, Twitter isn’t going anywhere any time soon. It’s become ingrained into consumers’ and companies’ communication channels. And it’s just getting started—under development are more tools to help enterprise customers manage and learn from the billions of tweets produced globally. Secondly, who said Twitter is for everyone? It serves a great purpose for many people, but it lacks Facebook’s wide range of applications (and thus wide appeal). It also lacks a great deal of the noise that many find makes Facebook a less than ideal business networking, news, and sharing environment. Lastly (and most importantly) is what the headlines are not conveying. Yes, overall growth is slowing—how could it not after posting 1,000%-plus growth in such a short time?--but the key for marketers is not the number of Twitterers but the habits, Technographics and psychographics of Twitterers. 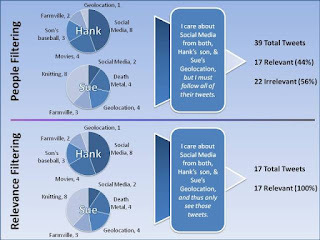 As Sean Corcoran and Josh Bernoff demonstrated in their December 2009 report, “Who Flocks To Twitter?,” Twitters are the connected of the connected, overindexing at all Social Media habits. For example, Twitterers are three times more likely to be Creators (people who create and share content via blog posts and YouTube) as the general US population. Twitter’s growth may slow (or perhaps it will see an @oprah-like bounce now that @billgates has joined and is generating PR), but its value to those who Twitter and to marketers is not in question into the very foreseeable future.